Several extension providers already offer shop by brand functionality, and now it is available in the Aheadworks’ portfolio. Meet the Aheadworks Shop By Brand Magento 2 extension – a part of Small Business Kit. If you are not familiar with what it is, check the following post. In a few words, the Aheadworks Shop by Brand module helps ecommerce merchants present new brands as well as promote customers’ favorite brands to increase loyalty and boost sales. Offering popular and trustworthy brands on your website will make your products sell themselves and motivate shoppers to come back to your store. 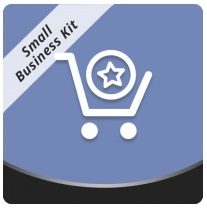 After installing the module, you provide store visitors with the ability to shop by the brand they want. The idea is quite simple: you provide a separate page for all brands and dedicated child pages. Everything is generated automatically basing on product attributes. To improve the presentation of a brand, you can add a short description and logo of the brand to its dedicated page, and assign particular products. As for product pages, they are enhanced as well. With Aheadworks Shop By Brand, you can add brand logos as well as a detailed description. Furthermore, you can display brands in a block via a widget which automatically identifies bestselling products and place it on the relevant product pages. Moreover, related products are also supported by the Aheadworks Shop By Brand Magento 2 extension. 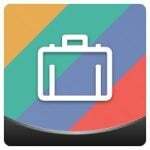 The module adds the “More from this Brand” related products block, allowing to upsell and cross-sell your products. A widget with the list of top brands can be displayed anywhere on your website, including category, CMS, and home pages. You can also specify “Featured Brands” that will be moved to the top of the brand list and highlighted automatically. 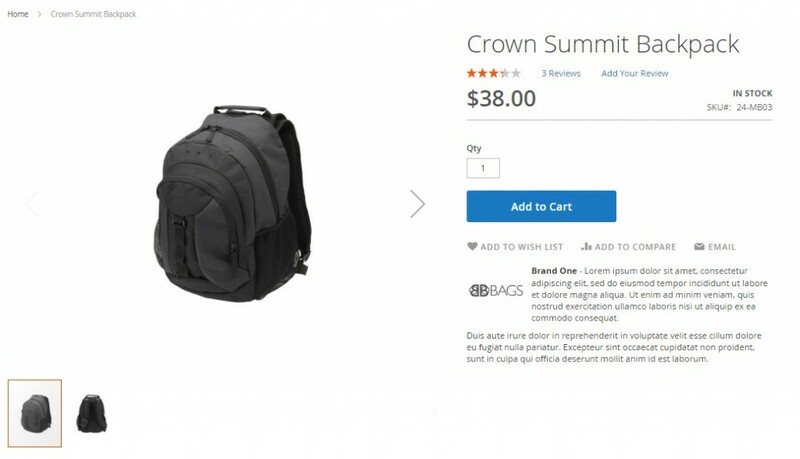 Using this function, you can present new brands to online shoppers in a smoother way. For further promotion, particular brands may have special discounts. As for the backend administration, the Aheadworks module enables users to manage all products related to a brand page from the Brand Products grid. What is more, the extension works with Layered Navigation, allowing to use brands as product attributes in the filter. Logo – don’t forget to upload brand logos to make your brand pages more appealing. The number of columns can be changed, and custom grid views can be saved for further usage. Also, since you can create an unlimited number of brands, there is a section with filters that helps to find the necessary brand without any headaches. 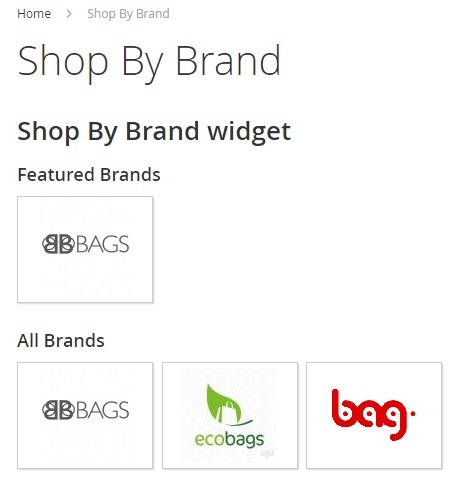 As for mass actions, the Aheadworks Shop By Brand Magento 2 extension allows you to delete brands in bulk. While adding a new brand or editing an existing one, you have to deal with two sections: General Information and Content. In the first one, choose a brand, add a URL key, upload a logo, and enable/disable Featured Brand feature. The Content section provides the ability to select a store view, specify meta title and description, as well as add a full brand description. Position – to specify display order of the products on a brand page. As for the extension configuration, it is split into 4 sections: General, Product Page, “More from this Brand” Block, and SEO. The General section allows you to select a brand product attribute. 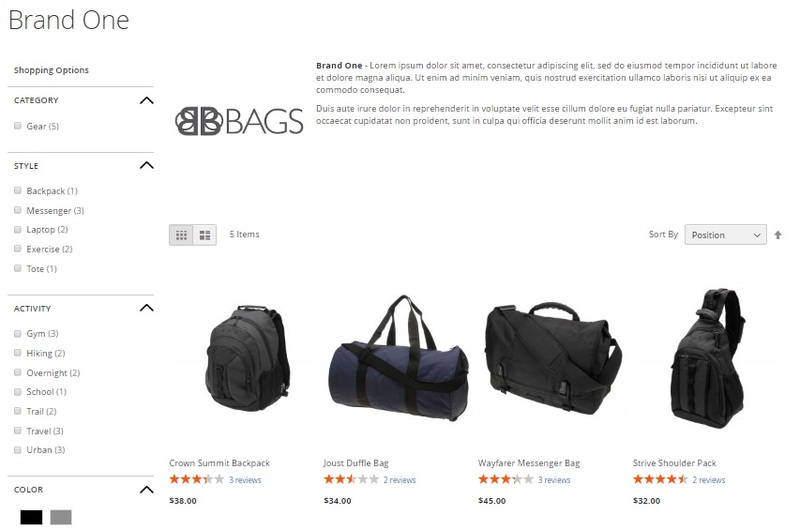 In the Product Page section, you can specify where to display brand information on a product page, as well as enable/disable brand description there. 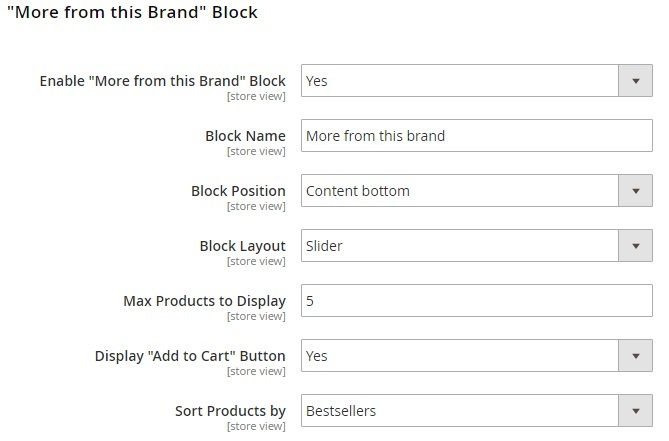 The “More from this Brand” Block section allows you to enable/disable the block, specify its name, choose position and layout, set a limit on the number of products that should be displayed, enable/disable Add to Cart button, and specify sorting method: Bestsellers, Newest, Price: from high to low, Price: from low to high, Random, or Position. As for the SEO section, it allows you to add noindex to pagination pages. All brands are gathered on a separate page. Here, your customers can select a brand they’d like to shop by. Besides, all featured brands are listed separately. Click on a brand logo, and you will be redirected to a brand page. Here, all products related to this brand are gathered. Besides, you can see a brand logo and description. The page works as a standard catalog with layered navigation and other features. As for a product page, it also contains a brand logo and a description which are enclosed in noindex tag to avoid SEO penalty. Besides, there is a section with other products from the same brand below. Note that a product can be added to cart right there.